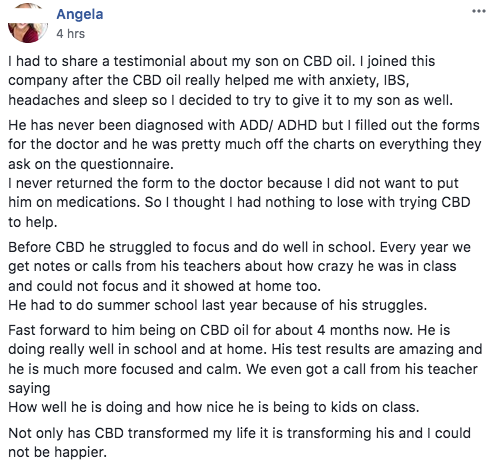 Angela, mother of a 9 year old boy, talks about her 9 year old son that she believes has Add/Adhd and starting giving him organic hemp cbd oil. She briefly mentions that she started using cbd oil to help with anxiety, IBS, headaches, and sleep. It has been working well for her so she decided to see how it works for her son. She had the forms to fill out for the doctor of his behavior patterns to see if he has ADHD symptoms. She realized that he was off the charts on most of the questions. She didn't go back to the doctor with her son. If you have been to the doctor for anything, you know it almost always results in some sort of prescription for a medication. If you don't want medication, then you have to seriously think about the actions you want to take when it comes to the doctor visit. 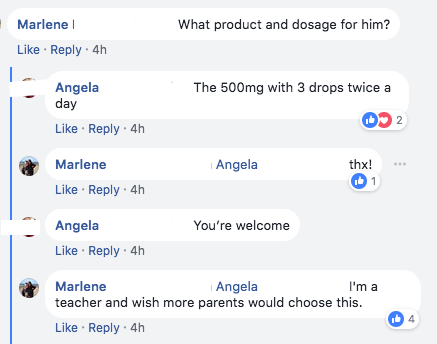 Angela decided to try cbd oil with her son. What kind of issues did her son have? He had a hard time focusing and his grades suffered in school because of it. His teachers would send notes and call her about how crazy he was in class. Not only did he have behavior problems at school, he had the same issues at home. He even had to go to summer school to make up for how poorly he did in school. He has been taking cbd oil for 4 months and the report is, he is doing well in school and home. He is focused, calm, and his test results are amazing. Now his teacher calls saying how well he is doing and he is being nice to kids in class. He is only using 500mg, 3 drops 2 times a day. This is a really small amount and the bottle will last a long time. It has transformed both of their lives.